There’s nowt so queer as folk. So said a Yorkshireman following a usability test where the participant was just plain awkward. We wanted feedback on the flow through a check-out process, but this pernickety participant insisted in reading all the terms and conditions on the website. He then refused to continue because he wouldn’t abide by them. “I wouldn’t” (and so came an end to this particular session). There’s nowt so queer as folk is a Northern English expression that means there’s nothing as strange as people. When you are building a product or service that will be used by the general public, before long you’ll come across some strange people. How are you going to deal with them? I once worked at a Pizza restaurant, owned by a fiery stuntman. A woman came in complaining that there was a fly in her half eaten pizza. She opened the pizza box and there on the cheese was a dead fly. She demanded a full refund and another Pizza. The owner listened patiently then told her in no uncertain terms that she was a bullshitter. He pointed to the fly. Look at it’s wings! He then pointed to the oven – “you are telling me that the fly was cooked in that oven and its wings didn’t burn. Madam, you put that fly on the Pizza!”. Haven’t you got better things to be doing? Call them outliers, random aberrations, freaks; there are some odd people out there and some of them are going to interact with you. Having customers should delight you but sometimes it is going to infuriate you, none more so when it comes to awkward or difficult types who are motivated to complain. Take a look at the Advertising Standards Authority (ASA) rulings. Now many of the complaints are one company taking a pop at a competitor, for example price comparison websites complaining about claims made in ads. 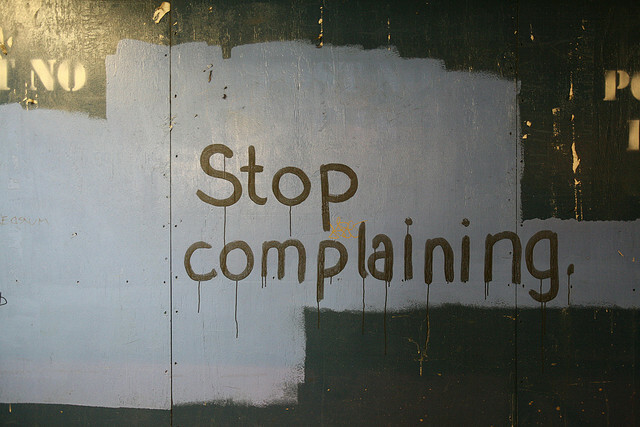 But many of these complaints leave you wondering, haven’t these people got better things to do with their time? You will get people “trying it on”. You run a promotion – there’ll be folk who bought immediately prior to the promotion complaining that they’ve been excluded and demand the promotion price be applied. Returns policies will be abused, and no matter how much you point to the terms and conditions there will be customers who will accuse and bad mouth you. Introduce any sort of product promise and you will find someone who finds fault with it. Something goes wrong and not everyone will be like you (understanding and respectful). So what if it outside your control – it’s still your responsibility. You are going to get some pretty rude correspondence. Social media is only going to amplify this. Are you going to be like my Pizza boss and accuse your customer of lying? Or refuse to deal with the customer because you think she is rude as the supermarket checkout assistant did? Or disbelieve and refuse to engage with as the Scottevest CEO did. Or be proud that customer service is irrelevant if you’re core product is differentiated by price alone, and call your customers idiots as O’Leary does with Ryanair? When you are working with people, remember that Yorkshire saying; there’s nowt so queer than folk. When you are building a product, you do all your customer development; you know that people are not like you, but when you launch, be prepared to discover quite how unlike you some people are. And in some cases how you really don’t care for some of your customers at all. Tim Brown from IDEO gave the audience at his TED Talk a simple exercise. He asked the audience to draw a picture of the person sat next to them. He gave them a minute to do so. He then asked them to show their pictures. “Sorry” was the stock reaction as the sketches were revealed. They had an inhibition on showing their work. When it comes to creativity, as we move beyond childhood we take on board inhibitions and feel more uncomfortable sharing our creative efforts unless we perceive them to be ready or any good. Getting a visual designer to share her work in progress is a challenge. We fear what others will think if our “deliverable” is not ready, is not finished or polished. We fear setting expectations, we fear disappointing, we kill our creativity with fear. So we are uncomfortable at letting others into our personal creative process. Now take this to the organisation, to the enterprise and creative genocide is abound. Like the Head of Digital who had 130 different stakeholders to socialise the Organisation’s new website designs with. Enter the HiPPO. The Highest Paid Person’s Point Of view. And with a few of those on board you get design by committee and design mediocrity. Or the client who refuses to engage with customers or end users in the early stages of the design process in fear of what they might think. A fear of setting expectations, a fear that their competitors might see what they are up to. Killing their creativity with fear. Letting go is the hardest thing. But it can also pay great rewards. On 27th October people coming out of arrivals at Heathrow airport were greeted by singers and dancers and general merriment. As an ad campaign for T-Mobile by Saatchi & Saatchi it was inspired, creative but not without risk. All the members of the public filmed had to sign a release form, agreeing to their being used in the ad. What if they didn’t? But they did. Whilst meticulously planned, the success of the ad is in the general public. T-Mobile got over any fear they may have had of the unknown and let go of the product to let the crowd create. It’s an uplifting piece, and successful too; their youTube page has had over 5.5 million views. And to the bottom line? The ad saw a 12% rise in sales the week after airing. OK, so it’s a guilty secret, I watch the Apprentice. Once upon a time a TV programme would have been broadcast, it would last the hour and then be over. Newspaper comment and water-cooler discussions would follow the next day. Today the show is bigger than just the broadcast hour; it has a digital life that goes beyond the TV medium. It’s more than just a website that is hosted by the BBC. Viewers participate in the the ‘back channel’ so as you are watching the show you are not alone in your emotions. Following the Twitter hash tag provides a running commentary of how the audience is reacting. Some shows extend their reach with the fictional characters themselves engaging in the dialogue. What Twitter starts with its immediacy, Facebook continues with the audience setting up groups. And so we have Stuart Baggs on the Apprentice, a clone of David Brent, treading on twitter and now spawning dozens of Facebook groups and pages (as I write 3228 people like “Stuart Baggs from The Apprentice is a **** not a Brand”). And let’s not forget the forums and blogs where comment and discussion on the programme thrives. The apprentice experience is more than just the it’s packaging and content. What about your product? Anyway. So last night the final five in the Apprentice were interviewed, with Viglen’s CEO Bordan Tkachuk being one of the interviewers. He cornered Stuart Baggs about claims he runs a telco. “Stuart you’re blagging to me. I know what an ISP is. It’s an Internet Service Protocol.” An Internet what? The CEO of a company that “has developed a peerless reputation for excellence in IT innovation, delivery and service” doesn’t know what ISP stands for?! It got worse. Later in the boardroom Sugar was grilling him about Stuart’s credentials. Smugly Tkachuk declared that Baggs “says he has a telecoms licence on the Isle of Man… What he had was just a very simple broadcom licence.” A what? Broadcom Licence? WTF is that? How can I trust you if I don’t understand what you are saying? Innocent are a great brand. They’ve got a great product, but they also know how to connect with their customers. From the packaging and beyond they come across as natural and friendly. Watching this video by the founders of Innocent is five minutes well spent on how they do this; how they use natural language. Friendships exist within companies, they exist outside companies. Friendships are about speaking a shared language with a simple vocabulary. Organisations strive to be friendly; they try to be social, open, transparent and service driven with employees and customers (look at your average mission statement to see how companies crave to be those things). Yet beyond this vaneer they hide behind a language that your friends (who are not part of that corporate vacuum), your family, your granny would be clueless about. Innocent prove that you can build a successful business thinking and acting as friends rather than as the faceless corporate-speak bureaucrat. 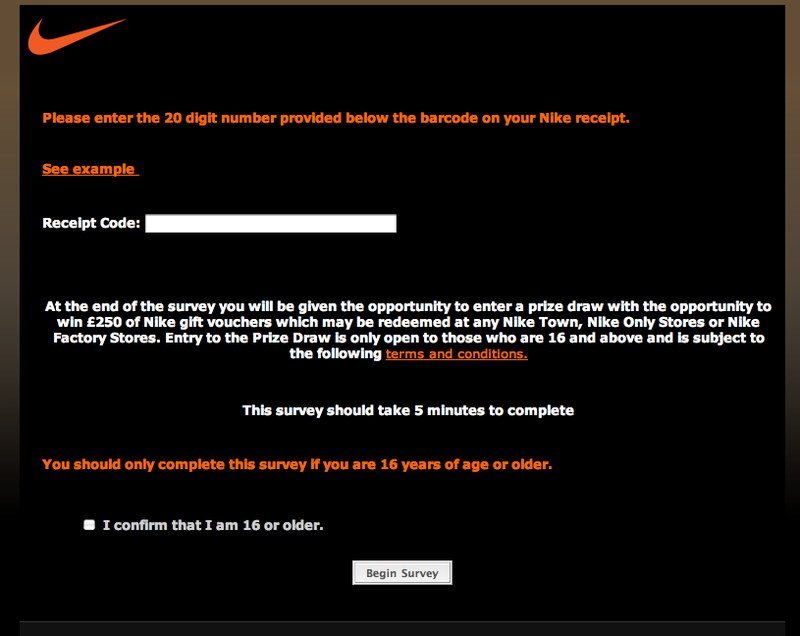 Nike know a fair bit about branded experiences. My new iPhone came with Nike + pre-installed. Usually this would not be relavent to me, my default setting being couch-potato. But for one reason or another I’m currently training, in less than a months time I’ll be punishing my body in water, bike and road, attempting to complete the London Triathlon. 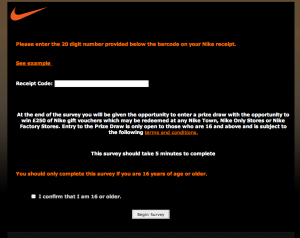 So Nike+ got me curious. To get it to work you need a sensor, so I took a trip down to the Nike Store in Covent Garden and bought myself a Nike+ sensor. The sales assistant (after failing to cross sell me a pair of trainers for the sensor), showed me the bottom of my receipt. “Look!” she said as she highlighted £250. “You could win some cash by going to this website”, (circling the URL in the text). Sometime later and I entered the URL (rather long and cumbersome) and landed on a page asking me to enter the receipt number. This presented me with a satisfaction survey on my store experience to complete. The system was not intelligent enough to know what product I had bought, and there would be little for me to gain by being presented that information at this point. At the end of the survey they invited me to enter my email address to enter a prize draw. With this simple process they have linked an anonymous purchase of a known product with an email address. An email address has value ; using a tools such as Flowtown from my social network activity they could start building a richer picture of me, including the extent to which I am connected and am an influencer. 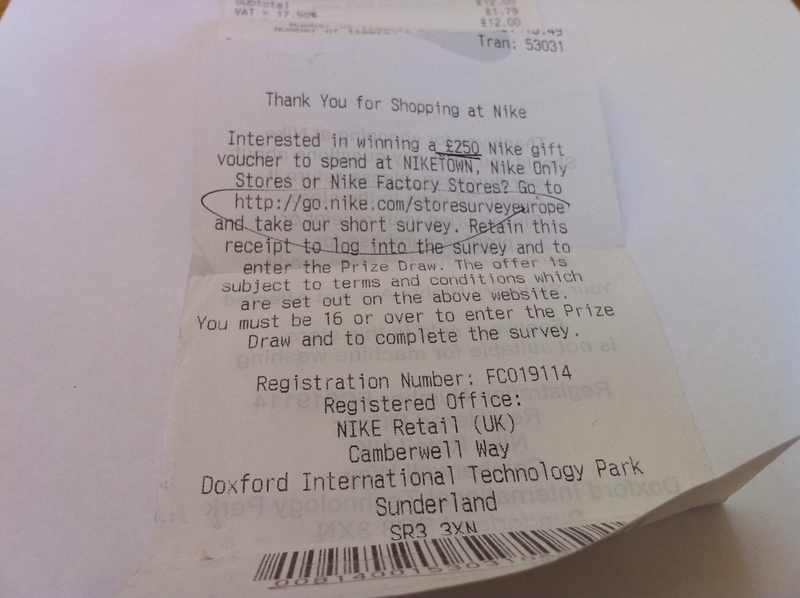 The supermarkets have used till receipts for marketing (e.g. Tesco clubcard points) for a while. But if you do not have an explicit point of sale loyalty scheme, this is an innovative way of connecting the offline purchase experience with an on-going on-line relationship. Of course Nike go well beyond this. From the iPhone app that was already installed, through to purchasing the Nike+ sensor, I now have a Nike account where I can track my running progress, uploading my training times after each run. That really is a 360 degree experience. A while ago Alec Brownstein was looking for a job in the advertising industry. He bought a bunch of adwords to appear next to the names of executives in companies he wanted to work for, and waited for them to google their names. Cool thinking that got him a job. something similar happened with ThoughtWorks this week. On the ThoughtWorks facebook page a little ad appeared, “Dear ThoughtWorks, My name is Scott and I want to work with you”. Clicking on the link opened a microsite dedicated to why ThoughtWorks should employ Scott Robinson. ThoughtWorkers soon picked up on this and twitter came alive with #dearscott and then this and this. He’ll still go through the intense recruitment process, but another great example for using Social Media to promote yourself and get a job. Bunch of grapes or bunch of arse? “‘ere, you say you’re in IT, whatcha make of this Facebook and twitter malarky? That Stephen Fry, what a tw@t, I don’t care that he’s just woken up and brushed his teeth. Now that QI, its a fix. He’s not so bright, he doesn’t know all the answers etc etc etc…. I’ll tell ya, Facebook and all that sh!t is a bunch of arse”. In the current market conditions just blindly running won’t get you ahead of your competitors. And standing still is not a sustainable option. Those that succeed won’t be the ones that batten down the hatches and retreat to the trenches, history shows it will be those that continue to innovate and cultivate ideas. During the 1990-91 recession, according to a Bain & Company study, twice as many companies leaped from the bottom of their industries to the top as did so in the years before and after. “Even though we’re in an economic downturn, we’re in an innovation upturn” said Bill Gates at the time. In the 1920’s Post and Kellogg’s went into the recession head to head. Post cut back, it reined in expenses and slashed advertising budget. Kelloggs meanwhile maintained their marketing spend and pushed their newly launched product, Rice Krispies. Today Kellogg’s are a household name. Where are Post? IT organisations are retreating to core, keeping the lights on and holding off any “non-essential’ projects, innovation included. This is a shortsighted viewpoint, but not entirely unexpected. With project life cycles taking so long, innovation traditionally takes significant investment and time to see results. Modern lean and agile approaches to IT are a challenge to this entrenched view. It is possible to innovate at speed. It is possible to take an idea and turn it into something tangible in weeks rather than years. Let’s start with the idea. Where does it come from? You could get the brightest minds from expensive management consultancy firms, but they take time. And in uncertain times, what do they really know? (I speak with experience having once been a customer strategy management consultant). Alternatively you could harvest ideas from your customers. That’s what IdeaStorm does for Dell. And Mix does for Oracle (built by ThoughtWorks by the way). Don’t restrict this to your customers, building an internal ideas engine in the enterprise yields great results. So once you’ve got the idea, how do you nurture it from a vision into a proposition that has legs? Product innovation is all very well, but do you have the capability and the attitude to really do it? In the current ecomomic climate, unless product innovation is in your DNA, chances are it will need to be accompanied by process innovation. Why? Because most organisational processes are slow, cumbersome and hinder the agility required to really innovate. In 2009, if there’s one thing that organizations need, it’s agility. Our economy and the business environment are a steady stream of ups, downs and rapid change; in such an environment, the ability to sense, respond and react are true survival skills! At ThoughtWorks we do both these things for our clients all the time, helping them introduce aligity into the whole product development lifecycle; product innovation through process innovation. It starts with helping them rapidly distill their vision into something concrete, then prirotising and estimating what is important before building it at speed with quality to get innovation to market; fail fast or succeed sooner. Recession doesn’t make the market need disappear. Andrew Rezeghi in this great paper (which is abound with stories of companies who have innovated through recession) argues you should invest in your customers, now they need you most, loyalty hangs in the balance. Whilst the market may be driving down prices, now is the time to focus on experience based differentiation. How can you use digital channels to engage with your customers in new and compelling ways? How can you harness social media and new interaction paradigms to delight and engage your customers? Ho can you innovate at speed? Go beyond your product and grow roots for lifetime value when the good times return.